As we live in days of storms and abrupt changes in the weather, be sure to click on the facebook page for regular updates as the weather unfolds. I use this as a vital tool in updating you and keeping you informed with the very latest information. I am often on the road, and away from my home computer. This is a great way to keep informed while I work away from home. BREAKING NEWS: Tornadoes have been badly damaged the town of Sedalia, MO, Be on alert for storms approaching YOUR AREA! Details available in ‘TODAY’S WEATHER ACROSS AMERICA’ below! 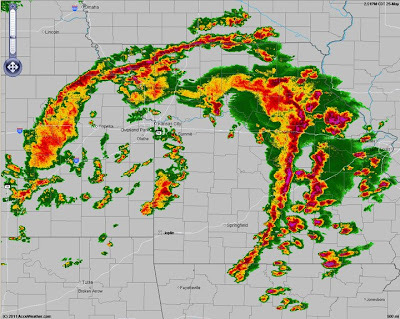 SEVERE (ROTATING) STORMS & TORNADOES CURRENTLY IN PROGRESS OVER MIDWEST! Thunderstorms are pin-wheeling around a strong upper low that’s centered over the Kansas-Missouri line. These thunderstorms that are constantly forming along the boundary and being fed by increasingly warmer and tropical air from the south are being powerfully fuelled by the intense wind sheer created by the upper low. The problem is, the tight upper low’s strong rotation adds to an already volatile situation and this feature may be responsible in which the lines of thunderstorms that form on the boundary may turn t-storms into tornado and severe weather producing supercells much quicker than normal. The spin of the low is actually pulling the thunderstorms back westwards, thus many who live WEST of the blossoming thunderstorms may be led into a real, and potentially lifetreatening false sense of security, so please be alert and aware of your CURRENT, not future or past weather situation but your CURRENT weather situation. 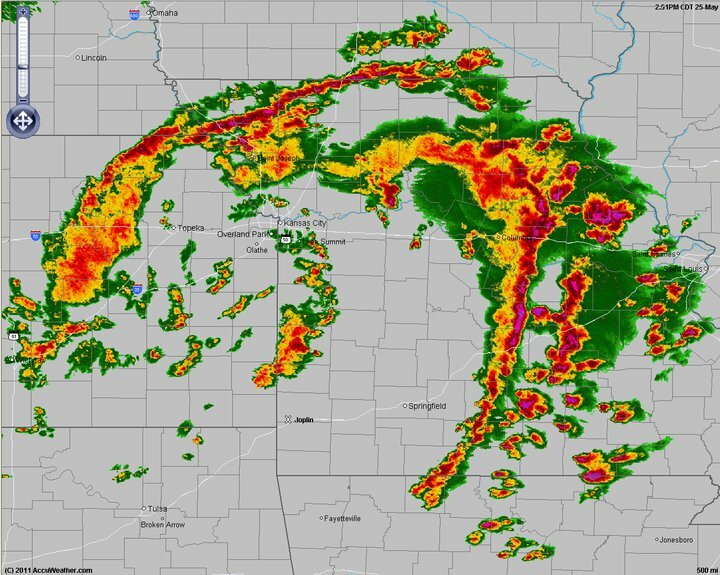 The reason for that is that with the extremity of the atmospheric conditions over the Midwest this afternoon and likely throughout tonight is harnessing the RAPID DEVELOPMENT AND TRANSITION FROM ORDINARY THUNDERSTORMS INTO DANGEROUS AND LIFETREATENING TORNADIC SUPERCELLS. I encourage you to check out and like my blog facebook page as I shall be updating regularly as this severe weather outbreak unfolds. As you can see from the maps below, the trough digs south and deeper into France over the next couple of days. The boundary which seperates the colder air from the warmth air will get it’s way into the mainland and cover northern Germany and Poland. What we’re going to see is a series of lows ride this boundary across the mainland and enhance heavy rains over Austria and Switzerland as well as across much of the continent. A vigorous low off SW Iberia will bring heavy showers and thunderstorms across Portugal and Spain in the coming days, however temps throughout will remain warm to hot with highs in the 29-34C range. Highs trim back for the next few days across northern France thanks to the UK trough dropping into the region. An upper low over the eastern Med will also enhance showers and storms over this region too. Maldives capital Male has had a windy day, with SW winds upto 40kmph today. Frequent showers during the day guaged up 32 mms of rain on Wednesday. Thunderstorms and heavy rains have been lashing western Sri Lanka since Tuesday night. Colombo had day long rains on Wednesday, and measured 66 mms till 5.30 pm. A thunderstorm lashed the city at 5.30 pm and 8.45 pm today. SW winds have been sweeping the capital. Ratnapura measured 96 mms of rain till Wednesday evening. Ratmalana had 56 mms and Galle had 28 mms. All reported cities are from the west and south west of the island.. Check out our partner blog here!